Ride for hours enjoying the comfort of a soft, Impact Foam seat and soft leather while knowing your horse is just as comfortable because of the Flex2 Tree. 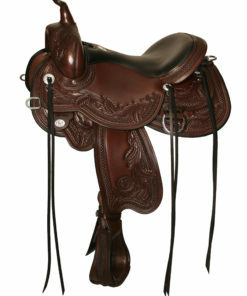 This saddle will free your gaited horse to perform his unique gait, while the short skirt won’t get in his way. The Alabama is the most popular option because of the all-day comfort it provides. The 3-way adjustable in-skirt rigging lets you position the rigging to suit your individual horse. The angled rear dee is great for securing your saddle when traveling over rough terrain. ErgoBalance stirrups tilt the stirrups to eliminate torque on the rider’s knees and ankles for increased comfort and promote balanced riding. Stainless steel hardware resists rust and corrosion and six sets of strings to tie all your gear. 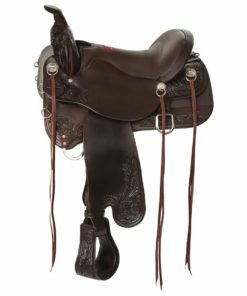 Flex2 saddles are designed to include comfort features for both the horse and rider that work in synergy with the Flex2 trree, and are designed for riders of all sizes- including those who need a 17” seat size. Only Circle Y has the exclusive Flex2 tree design which uses a rigid ground seat for rider support, a high density bar which disperses rider weight, a low density bar which is against the horse and provides give for freedom of movement. This results in a lightweight saddle that will never get wider over time, flex in half, or overflex to create pressure points if properly fitted.